Yesterday, I had the pleasure of delivering a session with Craig Jeavons at #Mathsconf7 titled ‘Implementing Academic challenge in KS3 using Nuanced Problem Types’. Craig and I joined forces because we teach in different parts of the country, in two different schools, but also because we work in contexts expressing the same philosophy and mindset about mathematics education. We both believe that teaching knowledge in year 7 and year 8 can be made more academically challenging by creating nuanced problem types, strengthening pupils’ understanding of a concept through designing a problem set using intelligent procedural variation. We both believe that memorisation of facts and creative thinking are not mutually exclusive. Craig and I chose a topic each, in which to create different problem types: I chose indices whereas Craig chose fractions. We chose these two topics because we wanted to select topics that some may consider mundane and standard to teach, proving to our audience that challenges can nevertheless still be presented in the teaching of both topics. In this blog post, I shall outline the six different ideas used in implementing a challenge in teaching the topic of indices. Indices, as a topic, relies on committing the knowledge of the first 15 square numbers and square roots, and the first 10 cube numbers, to memory. How can pupils commit this to memory? Ask them to try and recite it in the smallest amount of time possible? Give them a series of practice questions where they have to evaluate 93 (figure 1). Figure 1 – Factual Recall exercise evaluating the first 15 square numbers and first 10 cube numbers. Figure 3 – Factual Recall exercise evaluating a mixture of square roots and including cube roots from 11 cubed onwards. Give them a similar practice set of questions using square roots and cube roots (figure 2), and why not include questions where pupils have to evaluate calculations with square roots and cube roots (figure 3). Give them more than two terms in the calculation, include all four operations (figure 4). I like the second question, in particular, because pupils must distinguish the difference between √64 and ∛64 despite both looking visually similar (figure 5). This is deliberately designed to make them stop and think. …so on and so forth. This type of questioning is reliant on pupils having memorised 110, 111, 112, 113 etc. Have conversations around why visually similar problem types are not equivalent when evaluated (figure 9). Similarly, have conversations why visually similar problem types are equivalent when evaluated (figure 10). It does not matter the number of the root of 1, it will always equal 1. This then allows you to make your initial practice set of questions incredibly challenging, by including complex examples such as evaluating to the power of 0, evaluating 1 to any index number, evaluating any base number to the power of 1 etc (figure 12) . You can then scatter these newly learnt problems with previously attempted problems; and you have varied the problem set where you expect pupils to still be thinking about each and every question (figure 13). I did add questions where the power was greater than 3, additionally, to add some more challenge to the practice set (figure 13). Figure 14 – Demonstrating the pattern between the number of the root and the denominator of the fractional power where the number being rooted is equivalent. Multiple representation of the same knowledge fact. Why did I not start with the square root of a square number? The pattern is not obvious visually because the square root does not have the 2 visible like the third root of 27 or the fifth root of 32. Start with examples which state the pattern in an obvious and explicit manner, showing the exceptional examples at the end. Now, if I return to the initial practice set of questions, which includes calculations with square roots and cube roots (figure 15), I can use essentially the same questions but only now using a different set of visual representations of the same problem (figure 16). I have just made the teaching of the concept more difficult by making the structure of the problem more complex. The content here is the same as the previous exercise when I showed calculations with square roots and cube roots. The content is also the same because it relies on the same factual knowledge I expected pupils to memorise in the initial stages of teaching the topic. Figure 16 – Same problem types from figure 16 but using a different visual representation where square rooting of 49 is displayed as evaluating 49 to a power of 1/2. 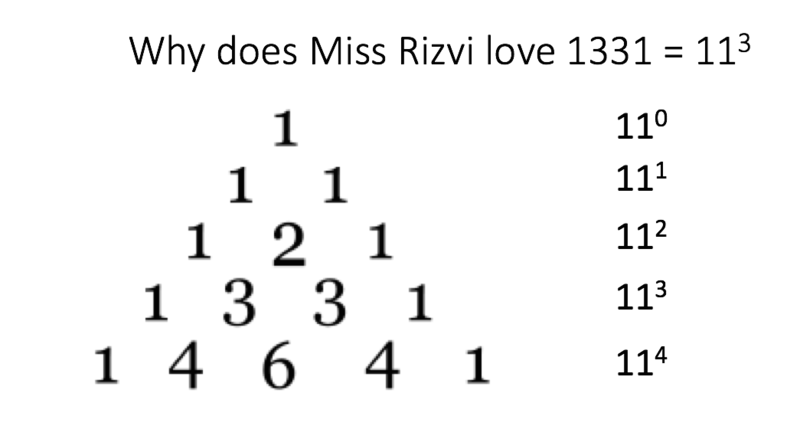 Remember, in the previous image where I showed that any number to the root of 1 will result in an answer of 1. I can now present students with the last problem type where 1 has a power of 1/100 (last problem in figure 16). Each questions relies on the same factual knowledge but whereas this is displayed differently – visually – and this is challenge I am referring to because it is still difficult for students to identify the structure of the problem and make the link that 3431/3 is equal to 7 and that 11/100 is equal to 1. I love it! Figure 18 – Problem types where more than one part of the problem or answer is missing. Figure 19 – Problem types requesting partial knowledge factual recall using square and cube roots. Figure 20 – Partial knowledge recall exercise. And so, that was a whistle stop tour on how teaching the topic of indices can be made more challenging, and in particular in respect of year 7 and year 8 classes, as presented at #mathsconf7. These six different ideas allow children to consolidate their knowledge of different facts about square numbers, cube numbers, square roots and cube numbers, through the six different ideas discussed above. I have attached a PDF of the powerpoint presented at La Salle via a link below. If there are any questions then please do not hesitate to get in contact with either Craig or myself via Twitter (@naveenfrizvi and @craigos87) or via email (naveenfrizvi@hotmail.co.uk). Enjoy! Thank you to everybody who took the time out of their weekend to attend mine and Craig’s workshop; we really appreciate your time and enthusiasm. Thank you to La Salle who hosted another great conference – you guys are awesome!